In-home meal: (1-24 guests) Your Balinese feast may include dishes such as pepes ikan (grilled tuna in banana leaves), a delicate and deeply satisfying dish, bumbu kuning (chicken in a fresh turmeric and coconut milk sauce), bregedel (corn fritters), and jukut urab (seasonal vegetables with grated coconut and fried shallots). 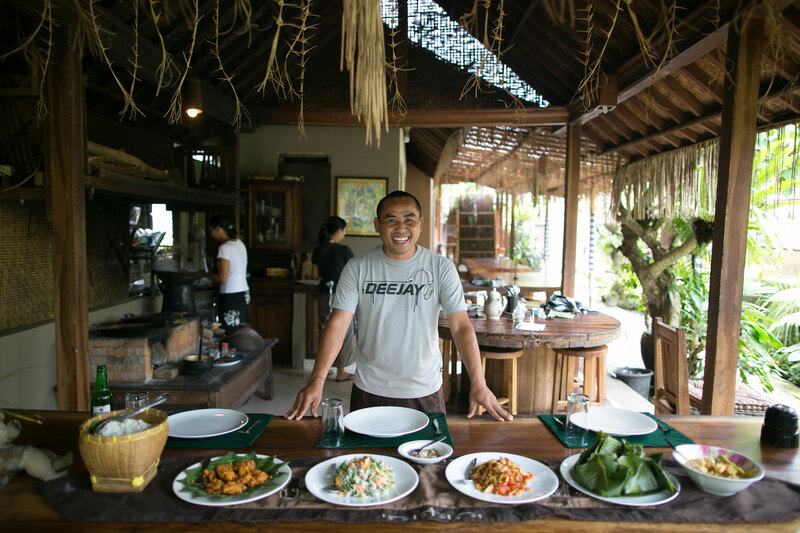 In traditional Balinese style, you will not eat your meal with Dewa and his family, although they will be with you throughout the rest of the experience. In keeping with their Balinese family tradition and sense of spirituality, your hosts will not share the meal with you at the dining table. Their preferred approach is to eat on one's own and focus on personal meditation to achieve a positive state of mind. Cooking experience: (1-24 guests) Your immersive Balinese experience begins by discovering exotic Balinese fruit and herbs near Dewa's home. 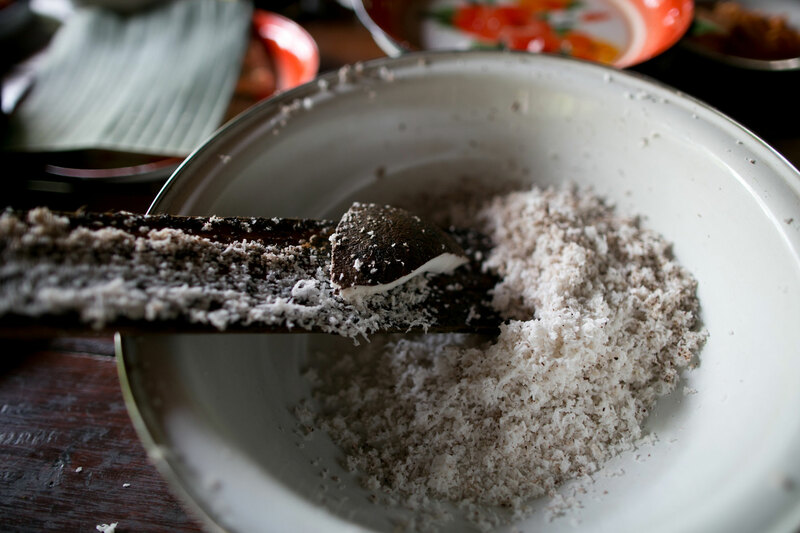 You will learn how local Balinese spices such as galangal, cinnamon, cloves, vanilla, cacao, and nutmeg are grown and learn about their medicinal properties. Then you will walk about 10 minutes to Dewa’s home for a tour of the family compound before you start cooking together. 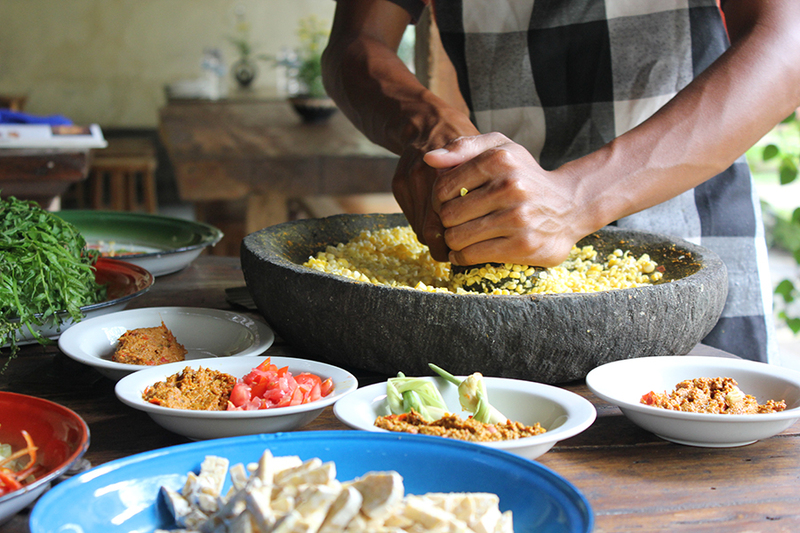 Join his family to cook a range of Balinese dishes using a traditional wood-fired stove. Expect a very hands-on, communal cooking experience during which you will grind spices and chilies on a large stone grinder, chop ingredients, and wrap fish in banana leaves. Notes: On days when Dewa is unavailable, an equally wonderful family member will host you with Dewa's wife Jero. Dewa prefers not to host just a meal for solo travelers. For solo travelers who only want a meal, Dewa charges a premium. Dewa can provide round-trip transportation only from Ubud hotels, for an additional cost. If you are staying outside Ubud, there is no transportation and Dewa will meet you at the Alam Sari Resort in Keliki. Our family of 4 learned so much about the traditional balinese way of life and food. We loved seeing their home, learning about their traditions, cooking with their wood fire stove, getting inspired by their nearly waste-free lifestyle and enjoying their gorgeous property. Dewa and his family were very welcoming and happy to have us! Definitely was a highlight from our trip to beautiful Bali! We met the most sweetest guy and had the greatest experience on March 23, 2019! He was non stop smiling and so welcoming! This was life changing. He was very accomadating to pick us up at our Hotel even after I accidentally sent him the wrong hotel. He told us about his family history which made this tour super personal. He answered all of your questions and loved talking about his traditional ways. The food was incredible and I'm so happy he had us jot down the recipe! Also his "doggie" was adorable!! Definitely book with him, you won't regret it!!! This will surely be one of my greatest memories and story to tell down the road! Spent 10 days in Bali and this was the absolute highlight. My wife and were looking for a traditional cultural experience and Dewa gave it to us. Being invited into his family home for a meal was an honor and priviledge. This is far more than just a cooking class. Dewa was so kind and shared lots of stories with us about Bali, the customs, history, traditions. It was a very special experience, one we will never forget. Dewa was great - we learned so much from him! The food was great, but honestly, it was secondary to talking to Dewa. Recently my friend and I took this cooking class, and it was one of our main highlights of our trip. Picked up from our hotel, our host drove us to his small village. We then walked around as he pointed out all kinds of interesting tidbits, from cultural and religious insights to animal, insect and agricultural information pertinent to his life. In his home, we were welcomed as part of the family. We cooked six different dishes, and were given recipes for each. Not only was it incredibly interesting to see the unique outdoor sinks and oven, but also we loved to learn how to make fresh coconut milk and lemongrass tea. Each recipe we helped to cook was absolutely delicious. There was one translator, and two women who were anchorage of helping the meal come to fruition. We were able to ask questions in an open, caring setting with respect and encouragement. I'm not sure which we loved more, the meal or the opportunity for an incredibly personal insight into the village life of these people. If you are hesitating, we highly encourage you to book this tour. You will not be disappointed, and your gorgeous, scrumptious meal will be one you will not soon forget. Cooking with Dewa was one of the best culinary experiences I have had! My travel partner and I are both avid travelers, adventurous cooks, and food enthusiasts. Dewa provided an exceptional educational and culinary experience- we both had good opportunity to learn and assist with the cooking process. I felt fully at peace, grateful, and most importantly, FULL, when we concluded our experience. HIGHLY recommended. Dewa was a most interesting guide and imparted a variety of very interesting facts about the lifestyle and views of the people of his village. Everyone we met was very welcoming and friendly and the whole experience was excellent. Primed with the knowledge of the way that Dewa's village viewed food and it's position in their lifestyle, we weren't expecting very much when it came to lunch how wrong we were! Dewa and a lady from the village explained how to prepare each course of a 7 course lunch menu which involved corn fritters, two chicken dishes and an excellent soya bean dish accompanied by 2 salad courses and a banana fritter dessert. We were involved in the preparation of each dish and each element was explained so that we could write down the recipes. After lunch, we were taken around the garden where the various fruits, vegetables and herbs were shown to us. This was followed by a visit to an area where students were learning art and we were introduced to their teacher and enjoyed a locally prepared coffee. Overall a very enjoyable experience that I would recommend to anyone with a view to learning a little more about Balinese food and culture. Best tour ever! A must do with Dewa! This was definitely an experience, a gift. Thank you Dewa. We love to cook with the best of ingredients and this wonderful opportunity broadened our understanding of so much more. The support given to the local village by Traveling Spoon is also a revelation giving a chance for tourists to get up close and involved in village life. Dewa was the prefect host, we learned a lot about Buddhist philosophy and Balinese way of life. And of course the food we prepared was heavenly to us. A big plus seeing the plants growing in the garden and having the recipes to make a similar feast we we get back home. Many thanks Dewa. WOW... I was truly blown away by how good this experience was, I HIGHLY recommend!!!! My partner and I did this on Thursday 3rd August, we stayed at The Stones in Kuta for our week holiday and made the drive out to Ubud, allow a good 2 hours we were a little late due to traffic Dewa and his family are the most kind, loving family, the food was beyond amazing and was so much fun to cook and prepare the meals with them, we also got to keep the recipes!! Their village, home and history behind their generation is stunning. I couldn't recommend this anymore! its a must do! I will be going back to visit them once I return to Bali. We were in Bali for 10 days on our honeymoon and were excited to do a cooking class initially looking at some small group classes when we stumbled on this experience. Our time with the host, Dewa was truly a blessing and amazing experience!!! 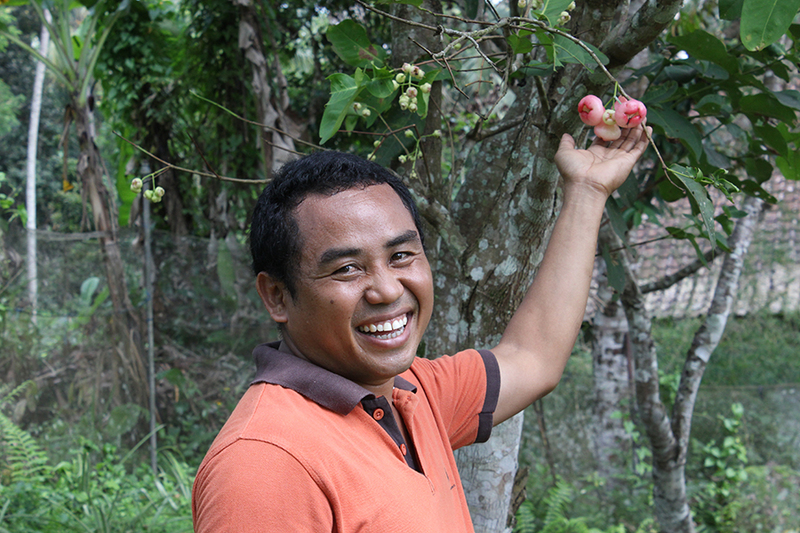 First, this is an incredibly authentic experience.... Dewa met us at a hotel close to his home we were in the vicinity and suggested coming to him and took us first on a walking tour of the local gardens, rice fields allotted to his home and neighbors and also local forest area. He explained so much about the agriculture, the history of Bali, the indigenous and also alien species of plants, herbs etc. We learnt why Balinese families have dogs, and also ducks and so much about the history of the people, the volcanic lands etc. Then back at his traditional compound, we were invited in and had a wonderful experience hands on preparing a multi-course meal, learning about the medicinal uses of all of the spices and ingredients drinking lemon grass tea over a series of days is a natural mosquito repellent!. We had extra food from our class and Dewa asked if we would like to bring our guide and driver who were waiting for us to the meal and they were blown away with the food we made. The is part cooking class, part cultural experience, and part insight into the wonderful mindset of the Balinese people.....thoroughly recommend!! Words cannot describe this experience, there is no doubt that this 'tour' is worth your time. Dewa is beyond authentic, with a smile and a calm voice, he opened the doors not only to his house and village, but to a philosophy of life that holds more truth than anything we own or desire, one that allows us to exist beyond ourselves in close connectedness to nature and the seasons, community and cycles of life. The food we cooked under the family's guidance was delicious, varied and plenty, and I do not exaggerate to say that some of Dewa's words have had an irreversible, amazingly positive impact on my life. 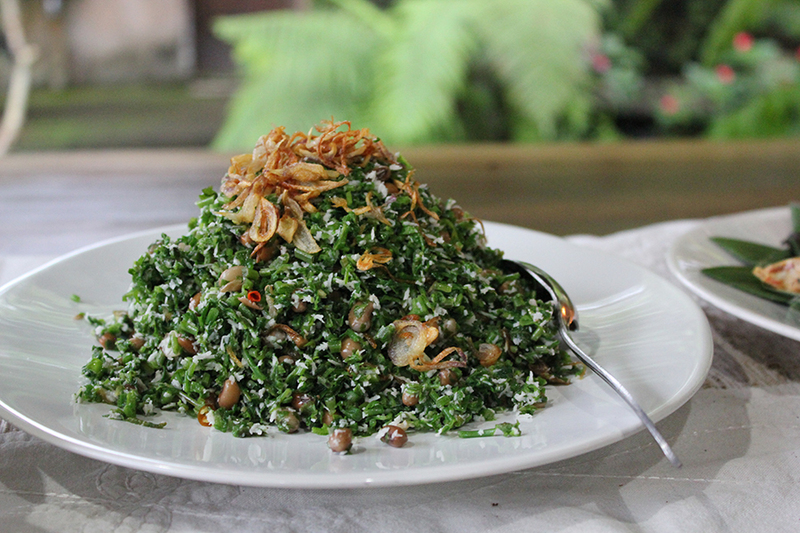 Yet, even if adding spiritual light onto your path while in Ubud is that's not what interests you, the time walking around the 'garden', and the discovery of the different wholesome ingredients that are included in these traditional recipes is just a time of simplicity, fun and joy. Also note that this is not one of the tours where there's many other people with you, it's a private tour and has a very different feel not that the other are not usually good, but this was the best cooking tour i've personally done- you also get to keep the recipes. A rich sharing experience that is worth every cent and more. Dewa, thank you so much for your light, Adrien and I shall carry it always. Until we meet again Sensei, I wish you and your family good health and happiness - Astrid. Again, Traveling Spoon has delivered an amazing experience. Everyone in my party was absolutely amazed and pleased with the experience we had. This is simply something that can't be found with other services. Our host opened her home to us, shared her life and customs, and guided us to prepare delicious food. Our favorite dish was the steamed tuna in a banana leaf. Can't speak highly enough of the great experience preparing a meal in Dewa's lovely home. Dewa showed us the surrounding area and helped give us an understanding of the spiritual and traditional influences on his family's life in Bali. Plus the food itself was amazing - will definitely be trying some of the recipes again soon. 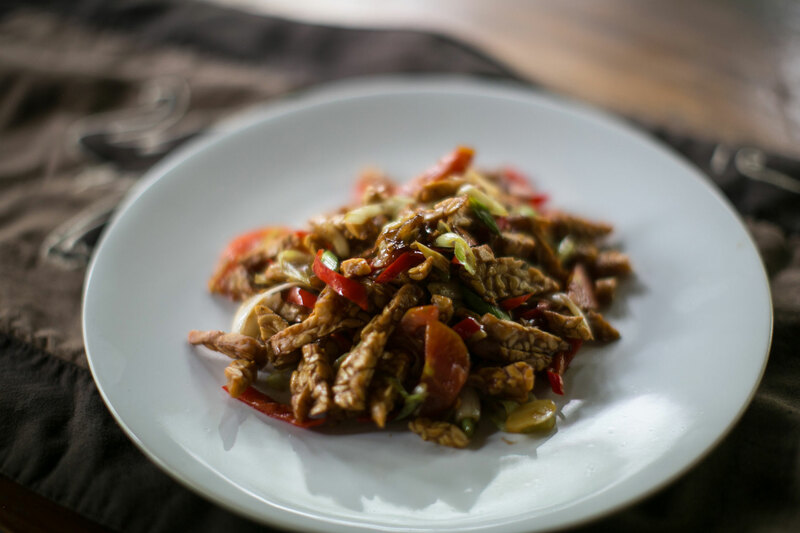 My favorite food was tempeh manis. We were welcomed into Dewa’s home and felt completely at ease. Dewa provided us with great insight into the culture of family life in Bali and the Hindu faith. We asked a lot of questions and Dewa responded with ease. We thoroughly enjoyed participating in the meal preparation and learning about the ingredients and especially appreciated the notebook to record the recipes for the food we would soon eat. Everything Dewa, his assistants and my husband and I prepared was delicious. By evenings’ end we knew we had experienced a truly special occasion, one of the most memorable from all our travels over many years. This was an amazing tour for any vegetarians or vegans, highly recommend it! We had fun, we laughed, and we learned to cook interesting dishes. More importantly, we got to spend time and make a connection with a really special woman, and we felt so honored to be welcomed into their home. (which was an experience in of itself, Balinese homes are so beautiful). Highlights are - getting a tour of the garden, having a puppy play at my feet, seeing the kids come home from school and chatting with our host, she was really so sweet. We had a funny moment talking about the similarities of harvesting palm oil, and palm sugar, with harvesting maple syrup. Thank you so much traveling spoon for providing this experience, It was really one of my favorite days of my entire trip. Unbelievably amazing! This was by far the best experience of my entire 3 week holiday in Bali. My partner didn't cook, I did, and even he agreed that it was an amazing experience. The setting is personal and beautiful, like everything in Balinese villages, and our hosts were so informative on everything we could think of. I wouldn't change a thing. It was absolutely amazing! Best culinary experience of any vacations- Dewa was very calming and offered a divine experience incorporating culture, food, religious practices, and general personal connection. My boyfriend and I had a fun time learning about the Balinese culture while magically preparing so much food. I wish we could've shared it with our friends and family back home because everything tasted so good. I'm very excited to have these recipes for life and the experience was a memorable one. We absolutely loved our Traveling Spoon experience. Dewa and his family were so kind, and it was so interesting and fun to learn from him about local gardening, cooking and culture. Our night at Dewa's house was probably one of the best that we had in Bali! It was a highlight of the trip, and an important cultural connection for our family, especially our kids. Our evening with Dewa, Jero and their family was simply a delight. The food, their stories, their patience answering all our questions, their heart-warming kindness - everything we saw, heard, smelled, stirred, chopped and tasted contributed to a wonderful experience that we will remember forever. We were picked up by Dewa's lovely friend Kadek, who brought us to the family compound, where we met Jero and her sisters-in-law, who had prepared everything already. Jero gave us a tour of the marvelous garden which was rather short since it got dark quite quickly. Dewa joined us a little later and shared his vast knowledge about Balinese food, culture and life in general with us. We enjoyed gorgeous dishes and the wonderful atmosphere of this lovely family home - all in all a great evening! Dewa was a wealth of information about his culture and the local environment. This experience was the highlight of our trip to Indonesia and has left us with so many wonderful memories and knowledge of the way that the locals live and view family, food, and life. 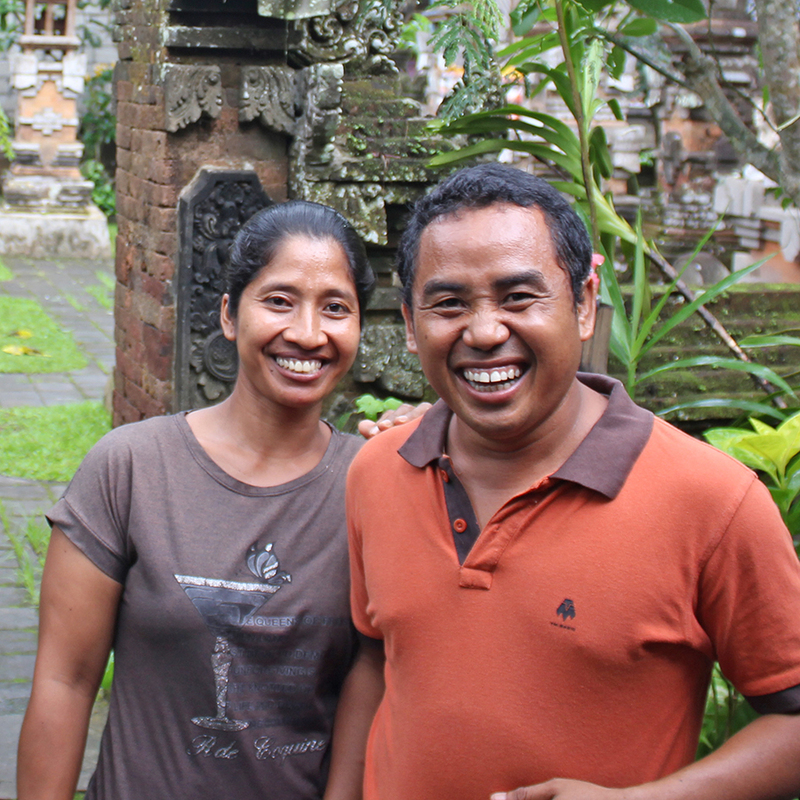 Dewa, my host in Bali, was the best host and it was the best experience I could ask for. He went out his way to make my experience the best as he was warm, welcoming, and loving. He showed me his home, his family and even let me write all my recipes down! Yum. I'm thrilled with my experience and would advise any one to do it! Incredible experience!!! Dewa and his family were the best, the food was incredible and we learned tons about a culture that is very special and different from what we are used to. I recommend this experience as the first thing once you get to Ubud, to have a better understanding of the culture and their traditions, which are everywhere! Truly a wonderful and memorable first Traveling Spoon experience! Dewa was a warm, welcoming and knowledgeable host and the food was delicious. This was definitely the best way to learn about Balinese food, lifestyle and culture. I honestly feel like we now have a caring friend that lives in a village of 200 people, deep in the jungle in Bali. The time we spent with Dewa, our cooking mentor, was absolutely priceless and I will never forget it. This was one of the highlights of our time in Bali! The food was incredible, and cooking in the open kitchen over a fire was a real treat. 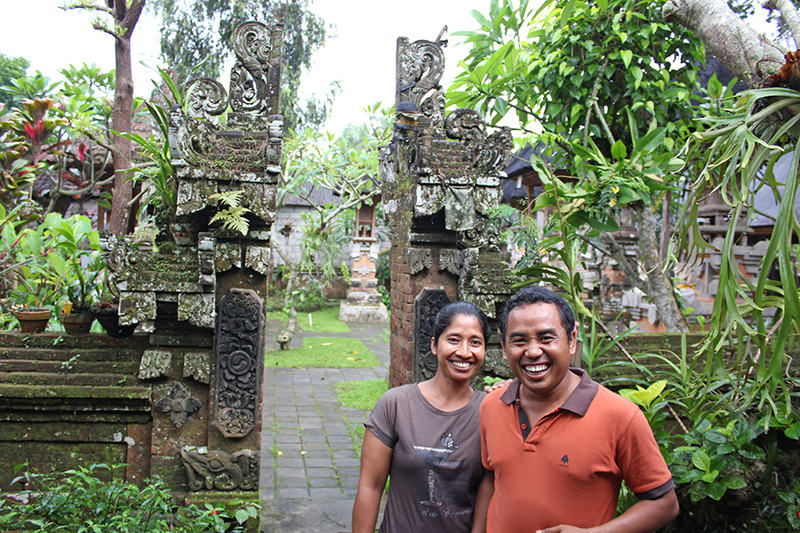 Dewa and his family provided great insights into Balinese culture and traditions. Highly recommend Dewa! My wife and I had an excellent time with Dewa this evening. He is extremely warm and inviting and puts you at ease right away. Honestly, I relaxed fully for the first time on this trip. We loved seeing Balinese culture from a local perspective, it's quite difficult to get this from the touristy hustle and bustle of Ubud. 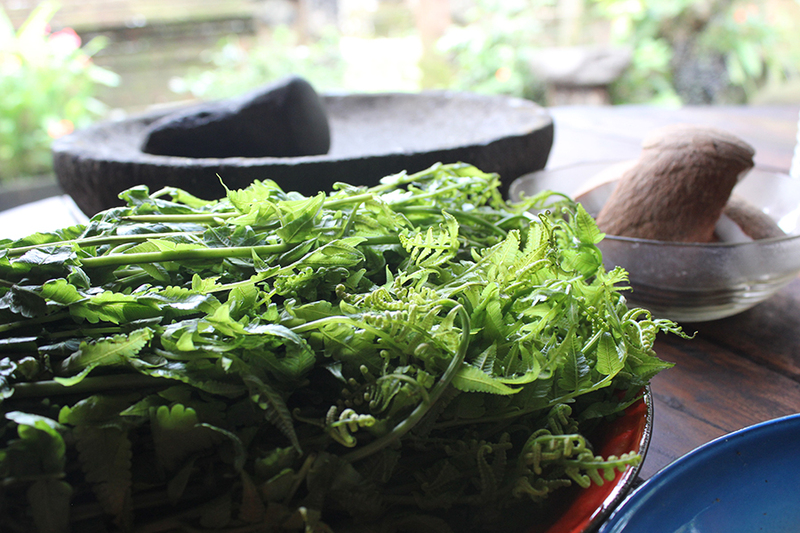 We learned from Dewa (in his very good English) not just the "what" and "how" of Balinese cooking, but also the "why". As much a lesson in culture and philosophy as in cooking. A definite highlight of our trip! This was hands-down one of the highlights of my trip to Indonesia! Dewa and his wife, Jero, were so warm and welcoming. They made us feel right at home and showed us around their compound, taking the time to really explain the local culture, their beliefs and how they lived, in addition to being wonderful cooking instructors. We learned about how the people in their village approach life and their relationship with food, which I felt made the experience far more enriching than just an ordinary cooking class... I can honestly say that it was worth every penny. I felt like I wasn't just learning how to cook a few dishes, I was discovering the local culture through food, giving back to the communities that I was visiting by supporting local business--and making two new friends in the process! I will definitely seek out Traveling Spoon again the next time I go away and plan to shamelessly plug it to anybody who asks! What an amazing way to get a real glimpse into someone's home, life, and culture. We learned so much about the Balinese culture from Dewa and the food was amazing night and plentiful, too. Highly recommend. It was a fantastic and unique experience we will treasure for the rest of our lives. 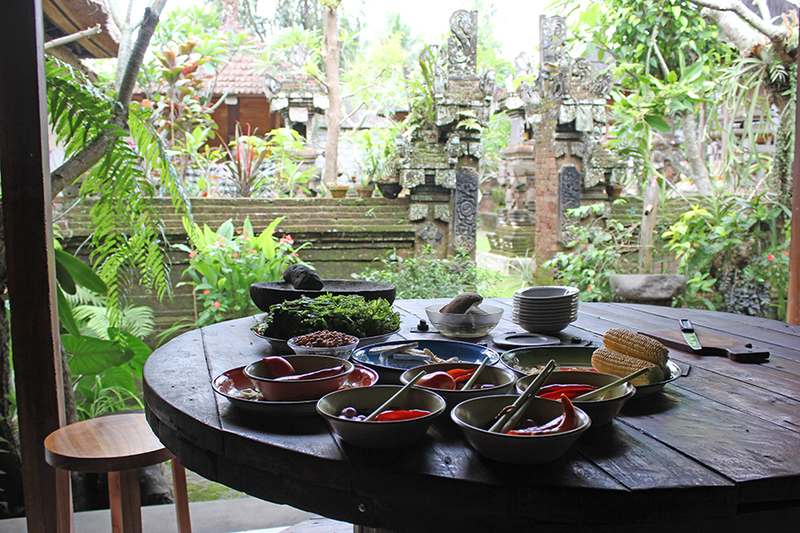 Dewa and his wife showed what true Balinese life is all about and we prepared the best meal ever! Nothing but amazing positive comments from all of us! Everything was fabulous. We all enjoyed the host, along with all of the information he shared with us, the food and the experience. It was a lovely day. Dewa and his family were absolutely charming and gave us the nicest introduction to Balinese culture you could hope for! Our host was just amazing. The way he shared their culture along with his relatives, their home and lives gave us the opportunity to glimpse a part of the true Balinese culture. The only problem is that now the standard is set extremely high for our next Traveling Spoon experience!! Friendly and genuine hosts in a fantastic setting. This experience was a gift for us... More than a cooking class, it was like a "way of living our lives class". At first we thought that the price was a little expensive for us as we were traveling for a long time, but DEFINITELY was worth it!!!! It was the best way to get to know and learn about the place you are visiting! Our host was awesome and his family was beautiful. After this experience, we will for sure repeat it in every city that we visit. Thanks Traveling Spoon for giving us the opportunity to meet Dewa and his amazing family... And the last thing: we have stayed many days in Ubud and we didn't like Balinese food until yesterday afternoon, delicious!!!!!!! 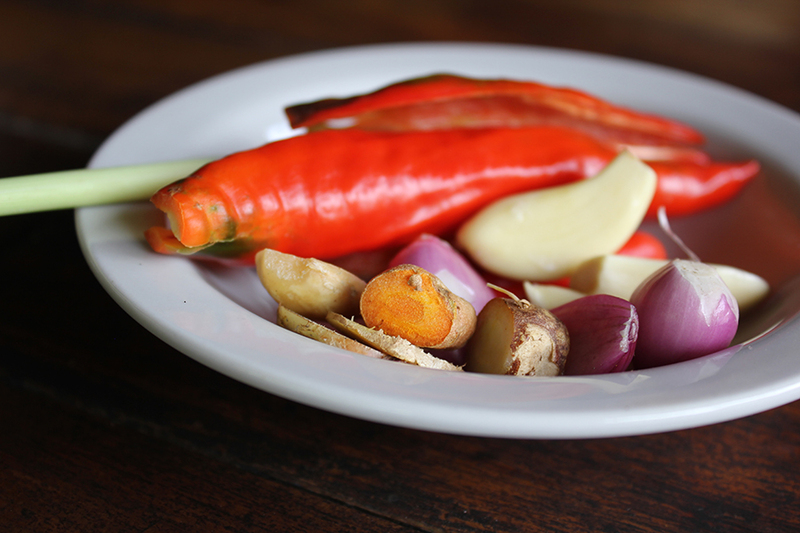 We had a fabulous experience and integration into real Balinese cooking and culture. Authentic food, setting, cooking, and people. Dewa was a really nice, laid-back host. He picked us up from our hotel and gave us some insights into the culture in Ubud, and his family's history dating back several centuries. He took us on a tour of his house/temple/garden, while introducing us to his family and explaining more about their customs and culture. Afterwards, we helped his wife and two daughters prepare the dishes that we ate for dinner. Dewa was extremely patient with us and walked us through each recipe, ensuring that we wrote down each one correctly so we could replicate at home. In instances where he wasn't sure if the ingredient would be readily available in the US, he also provided alternatives & substitutes, which was really helpful. The food was excellent and we really enjoyed having a part in preparing it. It was another amazing time! Thank you! We absolutely loved our experience. It was really fun, meaningful, and educational. The whole purpose of traveling for us is to broaden our minds and learn by meeting people with different ways of life. Doing this cooking class was perfect for that as we got a really intimate experience cooking in the home compound and seeing how they live through how they cook and eat. It was really special to spend several hours one-on-one with a local who really spoke English well and was able to communicate to us so much about his way of life. Our conversation and interaction started and centered around food but we branched out to many other topics like health, daily life, spirituality, and family. 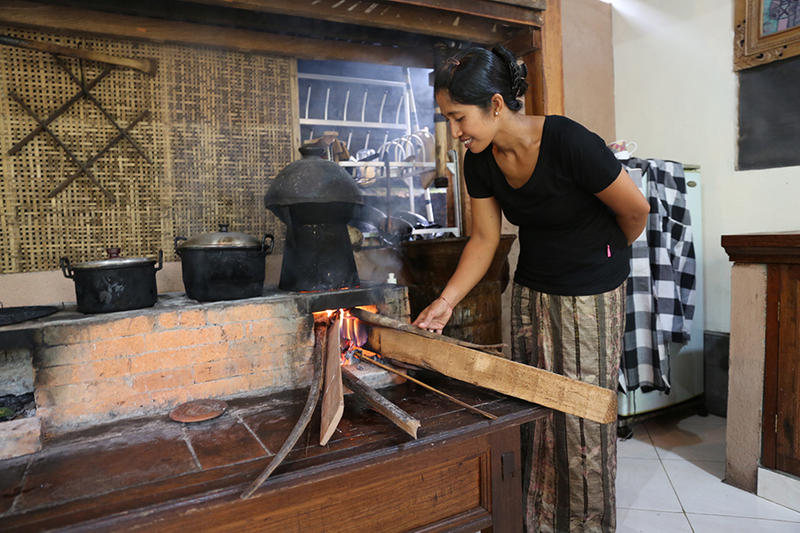 The environment of cooking in a local traditional kitchen was also very fascinating and immersive for us. We were really impressed with how self-sufficient the Balinese way of life is since almost all of the food was grown at home and many of the tools were home made as well... Our teacher Made was a really good teacher and really took care and time in making sure that he passed on a lot of knowledge to us so that we could bring our lessons home with us and keep them forever. We spent an amazing 4 hours together and made 5 different dishes, we really felt we got our money's worth and had a huge feast at the end! We love the idea of Traveling Spoon and are very excited to try it in other places that we visit! Made was a great host. So funny and friendly, the food was great. Just an amazing time. My three friends and I went into this experience without much knowledge about Balinese culture other than what we had gleaned from our travel books, and we left our hosts' house with every question answered in great detail. Dewa and Jero are a lovely couple who clearly have so much fun together, which poured over onto all of us. They and a few other women from the town had prepped a ton of food, but they got us involved with the chopping and grating and frying, not to mention eating!!! They explained each of the ingredients, discussing the health benefits and different ways of eating everything. 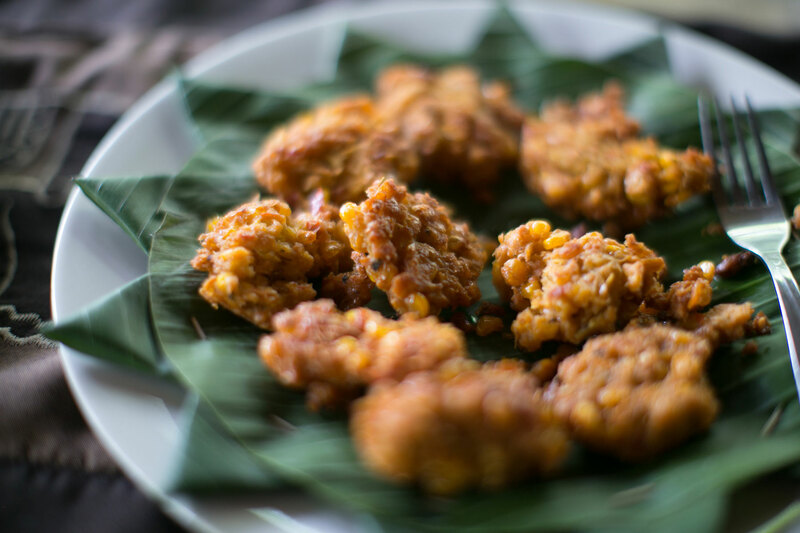 We got to grate and milk coconut, wrap tuna in bamboo leaves, and fry corn fritters! The meal we helped to prepare was so delicious that my mouth is watering now just thinking about it. Wow! In addition to the food, Jero and Dewa showed us around their family's home, which is a traditional multi-generation compound with pigs and chickens in the back and a number of different structures for sleeping, eating, praying, etc.The home was beautiful, and learning about their traditional practices (like the ways they name their children and their ceremonies) was fascinating. Dewa and Jero are warm, welcoming people with plenty of fun stories and insights on local customs to share (in flawless English, no less). I can't recommend a visit to their home highly enough. Thank you for arranging such a fantastic experience for us!! It was the highlight of our trip to Bali, and that is saying a lot!!! This was a unique way to immerse myself in the local Balinese culture through a lovely family that is passionate about sharing their knowledge and culture with me through food. I learned a lot about the Balinese lifestyle and cuisine and had a great time cooking with Dewa and Jero. 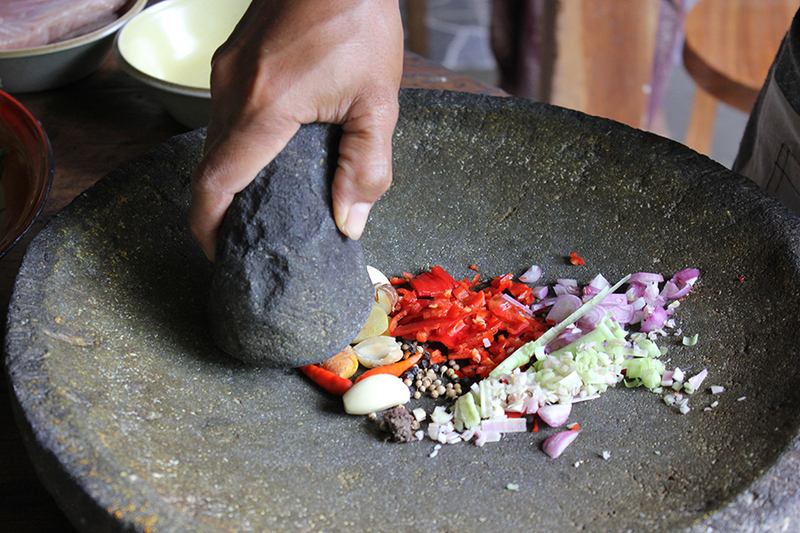 Jero can work the mortar and pestle like no other, creating fantastic Balinese spice pastes that are the foundation in many of their dishes. Our first Traveling Spoon experience was simply perfect from start to finish! Dewa and Jero were wonderful hosts. We learned a huge amount about Balinese culture and Dewa was happy to answer any questions we had. Their traditional-style house and village are beautiful. The cooking lesson was fantastic, and the resulting meal delicious. The experience was definitely the highlight of our time in Bali. My traveling companions and I visited a traditional Balinese family compound. Walking through the garden and rice paddies and learning about the culture from Dewa, our host, was an experience I will remember forever. There is so much wisdom to be gained by listening to people whose lives are different from ours. The Balinese people have few possessions, but their smiles are big and bright and their outlook is positive beyond belief. Thank you so much to Traveling Spoon for connecting us with Dewa and his beautiful family!